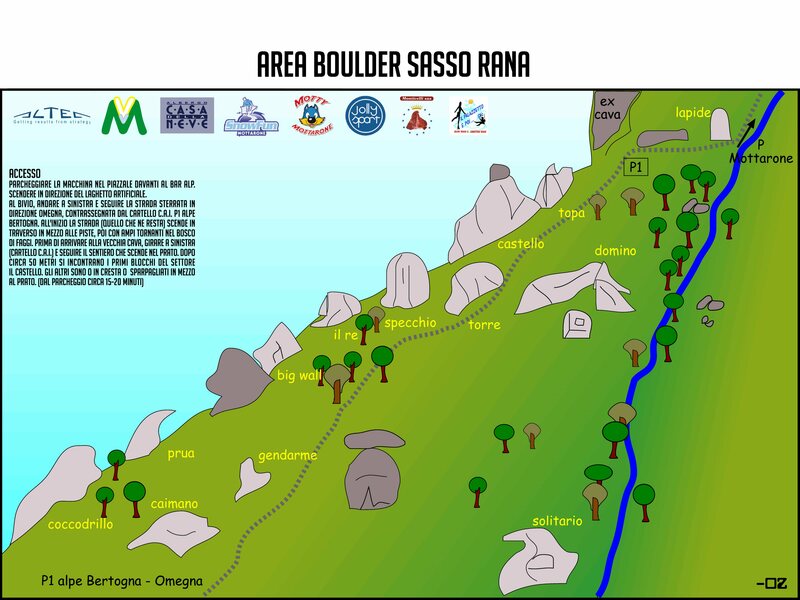 For our purposes, the bouldering between the lakes is conveniently close to Milan Malpensa airport. Being only an hour and a half by car the most organised climber could be on the rock only four hours after catching a flight from London. On day one we made our way North to the first climbing area Montorfano, arriving in mid afternoon to race the setting sun in search of a few climbs. This spot has some boulders hidden in the woods above steep granite cliffs that fall away to the show off the spectacular landscapes. The approach was a 15 minute hike up an old rocky road made slippery the wet fallen leaves. As it had been raining in the morning we climbed without much hope of finding any dry rock. Fortunately the pink granite that is ubiquitous throughout the area had remained soaked in places and, where it had stayed wet was sharp enough to allow a few sends before the sun set and we made our way back down the mountain and towards huge servings of pizzoccheri. In the limited time we had in the area we found a handful of interesting boulders but in the absence of a guide book for the area the key is really exploration. 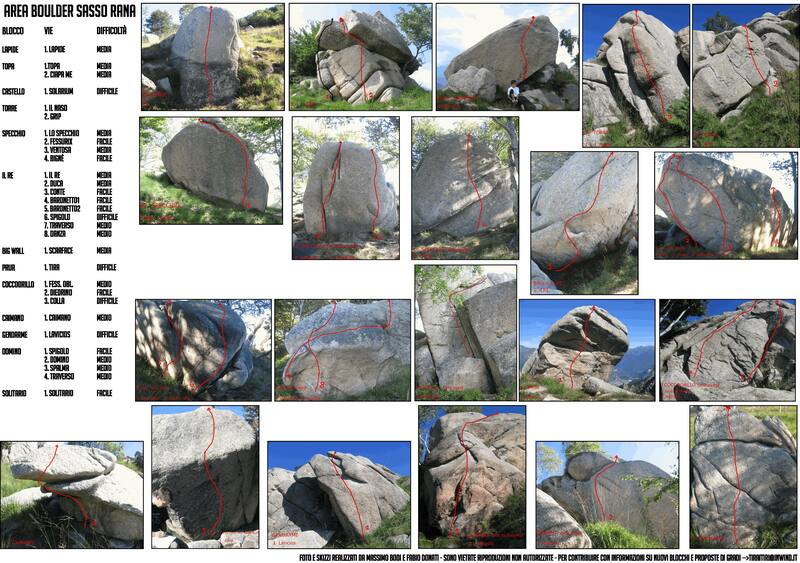 We spotted several areas with possible boulders but didn't have time to climb them. The second and third days found us at the local peak of Mottarone, hoping that the snow would stop and the rock would be dry enough to climb. As we approached the car parking area small flurries of flakes were blowing up from below and the temperature was a few degrees below zero. Our approach South-West took us along an exposed ridge with views on both sides obscured by heavy clouds. After 20 minutes of walking and sliding down treacherously slippery paths and wishing for boots instead of approach shoes we found the first clutch of boulders. Two obvious slabs with a bridgeable cleft between then and a featureless overhang above a precipitous drop that rolled away into the valley below. Attempting to warm up against the snow took up much of the first hour but once the clouds parted and sun was revealed we began to enjoy the unusual rock texture and wide variety of holds. Dan sent a beautiful short climb with a tricky first move before the snow abated while the rest of us played with a series of jugs over a steep drop that were large enough for even the numbest fingers to grip. The rock in this area is a rough and surprisingly loose granite with large, sharp crystals hues from grey through to pink. It made for excellent smearing on slab, but could be tough to trust for feet on vertical sections as the obvious feature would often crumble away at the slightest touch. We continued along the ridge to discover more boulders at a range of difficulties and some of the most spectacular views you could ask for in a climbing location. Watching the sun set over lake Orta and Monte Rosa is one of those truly special experiences. The third day brought us back to Mottarone but this time we headed directly West from the main skiing car park down the out of season ski slopes towards clusters of rock that we hoped would contain interesting problems. After some disappointing slabs and bitterly cold slopers Seb struck out on a reconnaissance mission and waved us over from across the valley to an outcrop with an obvious and precarious boulder perched on a pride-rock protuberance. Below the main plateau were three tall and obvious slab climbs that proved simple and satisfying and provided a great warm up for Seb's nail biting send of the precarious overhang on the top. This line was the highlight of the boulders we tried with strong moves and an intimidating top out. When it was time to leave the area we departed with the feeling that we had only scratched the surface of the what the local climbing had to offer. With a bit of perseverance and some local insight a group of boulderers could happily explore the area for many days without running out of potential new routes. A guide exists for the area for sport and trad climbing in the region but as is often the case with bouldering you'll have to make do with the few odds and ends dotted around the internet.